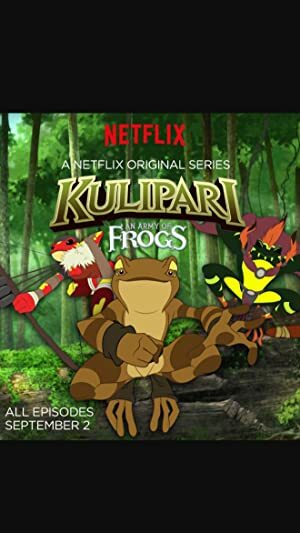 Kulipari: An Army of Frogs – Season 1 (2016) – What's New on Netflix Canada Today! Kulipari: An Army of Frogs follows the adventures of a group of tranquil amphibians who live in peace and safety thanks to an elite group of super powered frogs called the Kulipari and a Dreamcasting spell called “THE VEIL” spun by the Turtle King Sergu. This mystical veil cloaks their home in a mystery to the outside world. Suddenly this tranquil environment is under threat and turned upside down when the villainous Spider Queen Jarrah, (a one time student of King Sergu who now weaves an evil side of the Dreamcasting spell called “Nightcasting”), and Lord Marmoo, the feared leader of the vicious and numerous Scorpion Army, ban together. These two natural enemies now have one common goal…Conquering the Frogs. Enter our hero Darel, who is the only amphibian that believes this threat is eminent. Darel is a young frog who feverishly trains everyday to achieve his dream of one day joining the elite Kuipari Warriors. Despite his lack of experience and limited fighting skills he will suddenly have the chance to become the warrior of his dreams. Anthropomorphic frogs battle the forces of darkness.